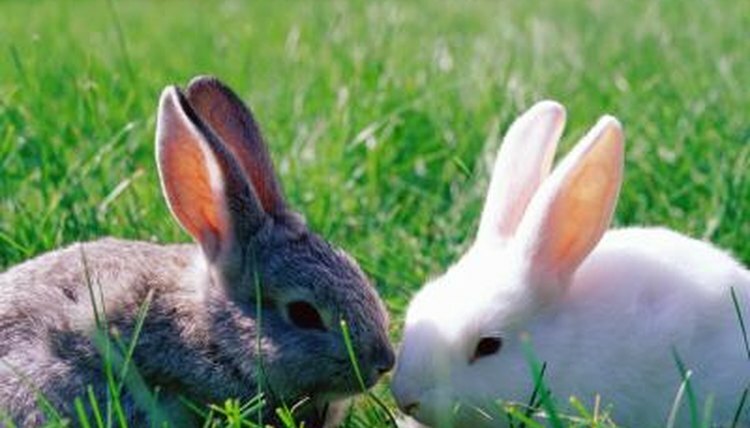 Rabbits get pregnant easily; they can produce multiple litters per year. A short gestation time, usually 30 to 35 days, means you don't have much time to find out whether your doe is pregnant. Watching and palpating your bunny at home can help you determine pregnancy, but a trip to the vet can tell you for sure. When you know the last date your doe came in contact with a male, count forward; if it's been more than 40 days, your rabbit likely isn't pregnant. If about a month has passed and you notice the doe making a nest of straw, paper or chest fur, she might be getting ready to push out some baby bunnies. A pregnant doe might also be disinterested in male attention if you put the two back in a cage together, sometimes showing aggression toward him. These aren't foolproof methods, but they can give you an idea of a doe's pregnancy status. Ask your vet to teach you how to palpate your rabbit's belly. When you push areas of her abdomen together with your fingers, you might feel marble-sized lumps about two weeks into the pregnancy. No lumps usually means no babies, but make sure you know what you're doing before palpating so you won't hurt the rabbit or the babies. To be absolutely certain of a pregnancy, ask your vet to X-ray the bunny.